Media captionAngela Little: "She was always very very frightened"
The report shows that some of the most vulnerable patients, including frail and elderly people, are enduring harrowing ordeals when they leave hospital. And that poor planning, co-ordination and communication between hospital staff and between health and social care services are failing patients, compromising their safety and dignity. One patient, a woman in her late 90s, died in her granddaughter's arms shortly after being sent home from hospital in an ambulance, without a proper examination. And a hospital transferred a distressed elderly woman to a nursing home in "a dishevelled state" with a tube (cannula) still in her arm. One complaint to the ombudsman was from a family whose mother had been left in her home with no food, drink or bedding, unable to care for herself or get to the toilet. Another was from a daughter whose frail mother, Pam, spent months in and out of hospital before her death. Pam, born Alma Waller, was 80 when she died. In the months leading up to her death in 2012, she was sent home from hospital several times. She lived alone and had Parkinson's disease and dementia. She was frail and unstable on her feet. After initially being admitted to hospital following a fall, she was discharged and readmitted three times over a three-month period. Her daughter, Angela Little, from Stevenage, says she still has nightmares about the poor care her mum received. "She was an infirm old lady and the hospital still sent her home. The ambulance driver had to carry her in because she was so weak. "I drove from my house, which is 40 minutes away, and I found this little old lady hunched in a chair shaking. She was absolutely terrified." Angela says her mother had contemplated ending her own life because she was so distraught. Pam was admitted to another hospital where she stayed until her death three weeks later. Angela says: "I still can't believe what happened. Things need to change." Parliamentary and Health Service Ombudsman (PHSO) Julie Mellor said: "Health and social care leaders must work harder to uncover why 10 years of guidance to prevent unsafe discharge is not being followed, causing misery and distress for patients, families and carers." The body that produces guidelines - the National Institute for Health and Care Excellence - said its recommendations were clear and should be followed. The Department of Health said the failings were unacceptable and it would ensure "lessons are learnt". The PHSO investigated 221 complaints - an increase of over a third in the previous year. Over half of these were upheld or partly upheld. A spokesman from NHS Improvement said patients should never be discharged from hospital without the appropriate safeguards in place. But he said neither should patients remain stuck in hospital. "Rather than frail elderly people staying in hospital longer than they need to, it is better to get patients home as quickly as possible and to assess them in their own homes rather than in a hospital - but this must be done with the right help and support in place." Phil McCarvill from the NHS Confederation, which represents NHS providers and commissioners, said: "The experiences of the people in this report were unacceptable and we know that everyone in the NHS will take the findings seriously." 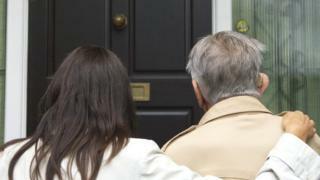 Ruth Isden, from charity Age UK, said: "It really is a mess and it's absolutely tragic for the older people and their families who're caught in the middle." The charity Independent Age said: "The individual cases highlighted by this report are tragic in their own right, but they are also a sign of a health service under severe strain." The Royal College of Nursing said it was hard for staff to consistently provide high quality, safe patient care without the right resources.